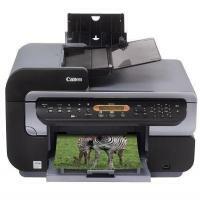 The Canon Pixma MP530 is an all-purpose printer for small office and home users. The device can print, scan, copy and fax as well. It is fully efficient to take the workload of any small office with the help of its long lasting high-quality Canon Pixma MP530 ink cartridges. The printer boasts advanced features like 30-sheet ADF, large control panel with dialing pad, PictBridge port, and availability to save up to 40 speed-dial numbers etc. The printer has a compact design but has a quite large footprint. It is 10.4 inches tall and 18.5 inches wide and has an ADF capable of storing 30 sheets and CIS scanner on top. The top front of the printer is covered with the control panel (from end to end). The control panel consists of a 2-line LED display, a number pad for fax dialing, and a few more different function buttons. The device also has dual paper trays and a built-in duplexer. The Canon Pixma MP530 is a great choice for a small office user. As the device is capable of doing all the basic printing, scanning, and copy tasks it also offer fax facility. It is efficient of taking heavy workload and produce great quality prints at high speed. Q. How replacing the ink cartridges of your Canon Pixma MP530 printer give better results? To carry out the replacement procedure one must follow certain steps before doing it. If your Canon Pixma MP530 ink cartridges are too old and you are still performing printing function through it, it may result in poor prints. Thus follow the steps below to replace the cartridges. Step 1: Ensure that the machine is turned on. Step 2: Raise the scanning unit (Printer Cover) until it stops. The paper output tray will open automatically and the print head holder moves to the center. Press the open button in order to open the paper output tray, if it does not open automatically. Step 3: Open the inner cover. Step 4: Push the tab and remove the ink tank whose lamp is flashing red fast. Do not touch the print head lock lever, only remove the ink cartridges. Be sure to hold the scanning unit (Printer Cover) firmly using both hands, and be careful not to get your fingers caught. A. Chipped ink cartridges enable the printer to read the ink levels in the cartridge and to ensure that cartridges produced by other manufacturers could also be used with the printer. Canon Pixma MP530 ink cartridges are chipped to maximise convenience for the user. A. Canon Pixma MP530 printers are quite bulky, measuring 18.5 inches in width, 18.4 inches in depth, 10.4 inches in height and they weight around 12.7 kg. Q. I feel that my Canon Pixma MP530 printer is too loud while printing. Is there any way I can use it with reduced noise? On a maintenance tab, click on Quiet Mode. A dialog box will appear. Select the appropriate settings based on your requirements. Make sure that the printer is turned on and then click send. Click “OK” when the confirmation message appears. Q. I have spare, unused ink cartridges from my old Canon Multipack MP600 and I was wondering whether I could use these ink cartridges with an Canon Pixma MP530 printer as well? A. Canon Pixma MP530 ink cartridges are the same as those used in the MP600. So, you can use the spare ink cartridges with an Canon Pixma MP530 printer. Just make sure that the old ink cartridges have not dried up. Q. Are the prices of the Canon Pixma MP530 ink cartridges inclusive of delivery? How long would it take for the product to be delivered to me? A. We charge a standard fee of €1.99 for delivery and courier. The product will be delivered to you in 1 - 2 days if your place an order before 12 noon. If your order is urgent, you can reach out to us on 048 30833221. Q. What should I do if Ink tank is empty? A. If the ink lamp is flashing, ink is empty. Replace the ink tank, and close the Scanning Unit (Printer Cover). If printing is not finished yet, just press the OK on the machine to continue printing in the “no ink” state. Replace the ink tanks with the new ones as soon as possible after printing has finished. The machine may found damaged if printing is continued under the ink out condition. Q. Do you offer refund in case the Canon Pixma MP530 ink cartridges get damaged during transit ? A. Yes, we offer an immediate refund or replacement in case, your order is damaged during transit. In this case, immediately contact our team and retain the original packing with your order. Q. How to clean the PrintHead nozzles for windows? Step1: Check the status of the printhead if they are clogged, print the nozzle check pattern. Step2: Perform printhead cleaning if the print quality is poor. This will resolve the clogged printhead nozzle issue and will improve the quality of the documents. Step3: If the issue stays after performing the print head cleaning twice, then perform print head deep cleaning. If the problem still persists after performing the print head deep cleaning, it might be possible that the cartridges are old or dried up and need to be replaced. Supplant the Canon Pixma MP530 ink cartridges and check your prints again. Q. I have completed with the cartridges that came up with the printer and now have to refill the ink tanks. Do you offer any refill kits? A. We do not offer any refill kits for the Canon Pixma printers. Refilling of the cartridges is not recommended, you can either order for the original as well as compatible range of Canon Pixma MP530 ink cartridges from our website. Q. How many ink cartridges does Canon Pixma MP530 require? How many pages should I expect it to print when I replaced new Canon Pixma MP530 print cartridges? The compatible version of the cartridges we sell have more efficiency in output than the original ones. The compatible Canon Pixma MP530 ink cartridges yield 420 pages each with cyan, magenta, yellow and secondary black cartridge while the primary black cartridge yields 360 pages. This is an estimate with respect to moderate usage of the ink. Q: What is the order of tanks according to which have to place the specific cartridge in the Canon Pixma MP530 printer? CLI-8BK (Black), PG-5BK (Pigment Black), CLI-8Y (Yellow), CLI-8M (Magenta), CLI-8C (Cyan). Q: I wanted to print borderless prints from Canon Pixma MP530 printer. Can you guide me for the same? A. This feature enables you to copy color images so that they fill the entire page without borders. The edges of an image extend off the paper slightly in a Borderless copy. It is recommended to adjust the amount to be cut off according to the image size. Load paper in the auto sheet feeder (with the print side facing up and with the short-side down) or the cassette (with the print side facing down). Open the document cover and load the document on the platen glass. Note: The ADF (Automatic Document Feeder) cannot be used for Borderless copy. Confirm that the machine is in Copy mode. If the machine is not in Copy mode, press the button to switch the mode into Copy mode. Press the button for the paper settings. The following page sizes and media types are usable for a Borderless copy. Page size : A4 / 4" x 6" / 5" x 7" / C-CARD / 8.5" x 11"
Press the left or right arrow to select the page size, then press the button. Press the left or right arrow to select the media type, then press . Press the button. SPECIAL COPY is displayed. Press the left or right arrow to select [BORDERLESS COPY], then press . Press the left or right arrow to specify the number of copy. Press the button for color copying, or the button for black & white copying. Q: What are the advantages of using the compatible version of Canon Pixma MP530 ink cartridges over the original version? A. The advantage of using compatible Canon Pixma MP530 ink cartridges over the original ones lies in their cost. Low cost and high utility of these cartridges make them a good and profitable choice for the buyers to go for. They reduce the running cost of the canon printer printers and hence become an ideal choice for the customers. Also, they yield number of copies than the original cartridges. Q: Will you recommend me to use your Canon Pixma MP530 print cartridges for heavy printing? A. Our Canon Pixma MP530 ink cartridges are a great choice when it comes to more number of prints. The compatible cartridges yield more copies than the original ones without any deterioration in the quality. For heavy use, we would recommend you to buy the multipacks of the cartridges listed on the following page: https://printerinkcartridges.ie/canon-inkjet-cartridges/canon-pixma-series/pixma-mp530.